The Life Dialogue: Young Earth Creationism 3 | J.W. Wartick -"Always Have a Reason"
I wrote in my last post on Young Earth Creationism (hereafter YEC) that I had missed one of its primary tenets, which is that the theological, not the scientific, should be the focus of the “origins” debate. This key point means that the challenge to YEC that it doesn’t have a fully developed scientific model doesn’t seem to be as much of a challenge as one may think, for YEC is grounded in theology, not science. The problem with this is that this makes YEC hard to evaluate in light of the other views (Old Earth Creationism, Intelligent Design, and Theistic Evolutionism) because its advocates rarely try to put forward a competing scientific model. Instead, YEC tends to be a view which focuses on pointing out flaws the arguments of its opponents rather than constructing its own models. While YEC does have some views which are offered for explanations of the world we observe (a catastrophic global flood is one possibility, though one visitor to this site commented on the scientific impracticalities of testing this), its case is largely built on attacking the other views as invalid. It is to this that we shall now turn. For now, let us focus on YEC’s case against the other Christian views of the age of the earth. First, YEC, because of its theological nature, is absolutely tied to the belief that the Genesis creation account of six days explicitly means six literal 24 hour periods. Ken Ham gives several reasons for taking this belief seriously in The New Answers Book 1. These reasons include the context of Genesis 1, the genealogies of Genesis 5 and 11, Exodus 20:9-11 pointing to six literal days, and that “Jesus was a young-earth creationist”. I’ll outline and critique these arguments below. The argument about the context of Genesis 1 focuses on the light/dark cycle for the meaning of days (26). This argument has some merit, though I think one of the key problems is that there was no sun for a few of the light/periods, meaning that at least something else must have been going on here. I do think that this argument has some merit, however. The genealogies of Genesis 5 and 11 would seem to point to the dates that Ken Ham and YECss tend to affirm (though Ham says it is about 6000 years, contrary to other YECs I have read who tend towars 10-15,o00). The problem with this is that it is that semitic genealogies tended to list only key people. Also, the individuals listed could refer to entire families or separate genealogies. I don’t think that the genealogies make a strong case for the YEC view. This is a fairly strong argument for the YEC, in my opinion. The parallel meaning of six literal days because of creation order tends to point to a more literal reading of Genesis 1. The only problem I see with this argument is that the 7th day clearly is longer than one 24-hour day according to all the Christian theology I know. What response could non-YECs give? I think one could argue that Exodus 20 is pointing metaphorically or figuratively back to Creation, and that the literal reading is at least slightly weakened by the 7th day. Finally, was Jesus a YEC? I must say I find it incredibly anachronistic to apply a position in a modern debate over the creation accounts to Jesus. Ham presents the evidence as, among other verses, Jesus saying in Mark 10:6, “But from the beginning of creation, ‘God made them male and female. '” This has some initial plausibility for pointing to a Young Earth, but one immediate problem I see with taking this as literally as Ham wants to is that Jesus says “beginning of creation”, which, if one were to take it very literally, means that Jesus is asserting that man and woman were created first, contrary to the creation account in the Bible. I still do find this verse an extremely strong argument for YEC, however. So, where does this leave us? I still think the YEC position has the strongest theological stance due to the ability to more easily read the accounts as six literal days. It seems to me, however, that other views have plausibility due to a day being as a “thousand years” for the Lord (2 Peter 3:8). YEC counters to this have not persuaded me that this could not mean that the Genesis account is longer than a literal week. The question I put forth is whether or not the Genesis account was intended as incredibly literal as the YEC position insists. Ham, Ken. The New Answers Book 1. Master Books. 2006. My exegesis of Gen 1 does not lead me top believe that literal descriptions of time period was the highest priority of the author. Moreover, I think that without that intent by the author, the justification for assuming a YEC perspective is weakened. You correctly point out that the YEC position is based entirely on theology and not on any observation of the universe: I would say that I don’t think that the exegetical support for the YEC position is strong enough to justify it. Right, one important consideration is to think about how much we have possibly anachronistically interpreted the text if we take it as literal days, and whether that was ever intended. I’m not sure if the textual evidence favors either side here. I’ve read Genesis 1-3 in Hebrew, and it seems sort of inconclusive as to which way one would go with it. Coming as someone who I guess would be considered a YEC, I think objective hermeneutics becomes important when looking at the context for Genesis. The authorship discussion becomes important because if we look at the objective meaning for the text, we would have to apply this meaning to anywhere the book of Genesis doesn’t appear to be purely symbolic. So if the author’s intent was to be symbolic with literal-sounding wording like “days”, then we would have to throw into question other literal-sounding wording like “created the beasts of the field and birds of the air” or “water covered the earth for 40 days.” By placing all the eggs in the basket of author’s intent, it leaves much of the book open based on what your personal interpretation is of the author’s intent. It also becomes important to note the author’s intent when using internal literature to make contentions. 2 Peter 3:8, when looking at it for what it actually says, appears to denote the idea that God is not kept in or limited by the finitude of time (the inverse nature of the statement is what implies this, for if it were supposed to be symbolic of a certain event the second half of the statement is not needed). The first part of verse 9 seems to reaffirms this point. So using symbolic text and ascribing it to what gives for all indications a literal-sounding description seems like splitting hairs or shoe-horning language. I think your point to Exodus 20 is a strong one for YEC, particularly when you consider the language used to describe the idea of the Year of Jubilee. We don’t see any symbolic “day” language, but it uses the term “year” to mean an actual year when making this comparison. In fact, I would say the closest we get to symbolic language in reference to dates in the Old Testament is probably the “seventy sevens” of Daniel, though even that can be taken literally, depending on your interpretation of “sevens.” Most people do take this to mean “years” based on the prophetic nature of the passage and what has already been fulfilled. I guess ultimately what I’m trying to say is that when looking at it hermeneutically, it’s best to assume that when the Bible wishes to be symbolic, it will appear symbolic (similes and metaphors, like 2 Peter 3:8), and when it wishes to be literal, it will appear literal. 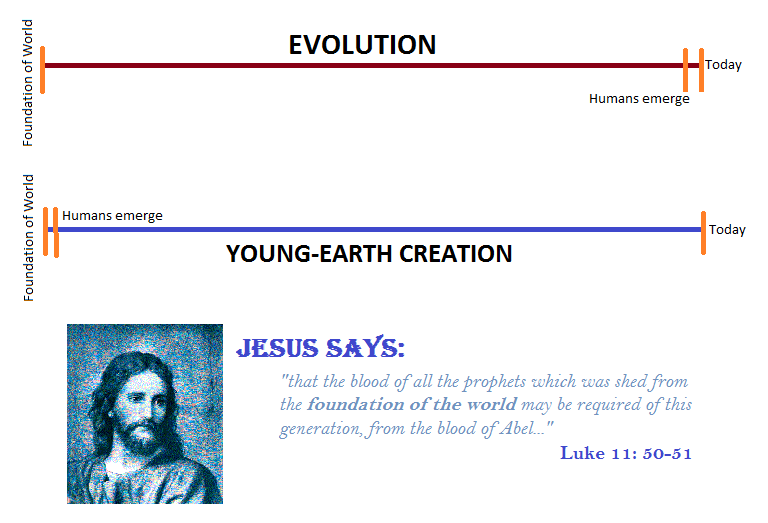 So the YEC position is logically on the firmest foundation as far as I’m concerned. Does any of this matter in present day? Not really. At this point we ought to be more concerned with the end than with the beginning. Thanks a lot for your comments. One thing I want to note immediately is that I appreciate you noting that “At this point we ought to be more concerned with the end than with the beginning.” This is a point I think all Christians need to realize in this debate–we should be charitable. Moving into your arguments., now, one thing I would immediately say in response is that when you write “So if the author’s intent was to be symbolic with literal-sounding wording like ‘days’, then we would have to throw into question other literal-sounding wording like ‘created the beasts of the field and birds of the air’ or ‘water covered the earth for 40 days. '”, I would say that you have missed one important linguistic point, which is that we very often do use “literal-sounding words” as metaphors. That’s exactly what a metaphor is. It is the context which matters in determining what usage of the words are intended. And here the context could be seen as an account of Temple Theology (see Matt Moss’s series of guest posts on this site links here). Fairness dictates me noting that Matt doesn’t see his view as being particularly helpful to other (not YEC) views, but I do see it as such. For if the author was writing about the creation of the world in temple theology, and that same author (Moses, as I believe–not the JEDP) continued this temple theology through the Pentateuch, we have a very cohesive structure here. Further, when one applies the temple theology of Christ to the mix, not to mention the Psalms and Prophets, there is a strong argument from this very strong unit that Scripture is indeed inspired. Further, if this theme is the case, then reading the days literally could be applied the charge of anachronism. So I think your point of “literal-sounding words” doesn’t hold up under scrutiny. We could take any number of things as “literal-sounding” but then mess up the whole of Scripture! For example, Jesus was very “literal-sounding” when He talked about destroying the temple in three days and then building it back up, but if we took these words, which seem very literal, to be literal, then we would miss what Jesus was actually saying–that He would die and rise again. Therefore, again, I’m not sure how strong your argument is. I tend to think it’s not terribly strong, particularly when other uses of the same Hebrew word, “yohm” (or “yom”, depending how you want to transliterate it) are indicated as being long periods of time. I guess I don’t see how that quote does anything to make it seem as though Jesus was a YEC. Reading that literally, that means that prophets were killed before creation. Or reading a different translation, the generation of Jesus’ time would be held responsible from all the prophets since the beginning of the world. I’m not sure how that implies YEC, considering that what it seems to say is that they will simply be held responsible for all the killed prophets.